This project’s challenge was to accommodate childcare for 320 children and parking for 1100 cars in a dense urban neighborhood. 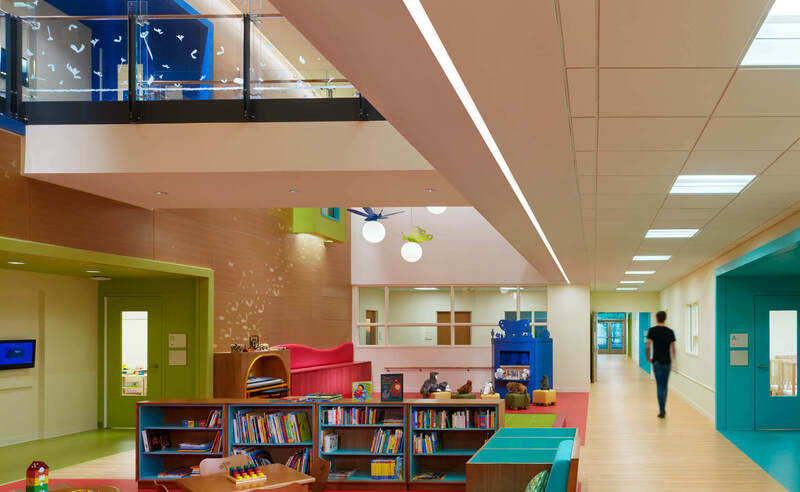 ESA created a context-sensitive 13-story building with a welcoming, light-filled childcare facility on the first two floors. The childcare design emphasizes nature and discovery-based learning. It maximizes outdoor space with a protected playground on each of the two floors and a garden on the rooftop. Classrooms and flexible learning spaces are organized around a two-story atrium that also functions as a library and music center. A bridge traverses the atrium, and cantilevered windows overlook its activities. Reading niches, colorful portals into classrooms, and child-scaled elements show a special consideration for children’s sensory and emotional needs. Multiple levels of safeguards ensure security as parents move further into the space. Sustainable features include geothermal heating and cooling, advanced temperature control, and fresh air exchange. The parking facility also accommodates bicycle commuters.